I had one hell of a week. My bank account was hacked, I slipped on ice and chipped an old filling. Then my aunt died. So, after the funeral, I was elated when my sister told me one of her friends had an extra ticket to see an Elvis impersonator. I jumped on the chance to say, “YES!” The only thing that would have made the night even better was if she had two extra tickets so my husband could have attended too, since he’s a musician and fellow Elvis fan. Back in 1989, I originally saw Mike Moat with my sister, mother and grandmother and he was fantastic. Shame I waited 25 years to see him perform again, as it was a class act! I immediately recognized that he had some of the same musicians with him — Rich Fontana on keyboards and his wife Debbie Moat (who is still cute as a button) on vocals. Two other family members are in the group: his brother, Bob Moat on lead guitar and his daughter, Michelle Moat on vocals. 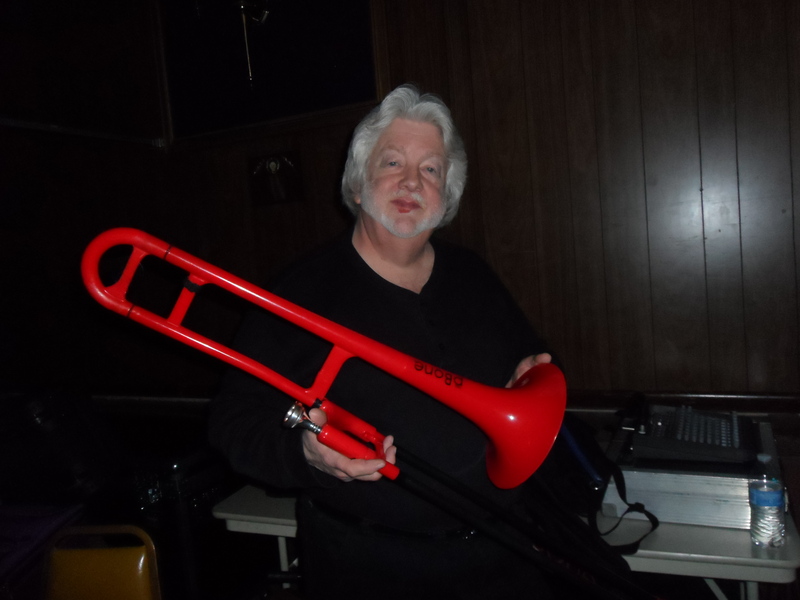 Other members include: Ron Graniero (drums), Andy Paleologos (bass), Phil Rinaldi (trumpet), John Urspruch (trumpet), Mike Mullan (saxophone) and Phil Jones (trombone) — who actually played with Elvis Presley, Johnny Cash, Dolly Parton and Barbara Mandrell. The first set was the entire “Aloha From Hawaii” album. My favorites from this were “Welcome to My World” (I went to the bathroom, called my husband and played a portion of this for him! ), “Suspicious Minds,” “Can’t Help Falling in Love With You” and my all time favorite, “I’ll Remember You,” which always makes me cry, big time, since it’s the song that reminds me of my beloved Grandmother (and I’ll be using the lyrics for a fictitious scene in my third book, which I’m aiming to publish in 2016). Mike Moat wore a replica of the “Aloha From Hawaii” jumpsuit (see picture above). During intermission, my sister and I were determined to speak with Phil Jones. He was so awesome, taking to us for a very long time and letting us take pictures and signed the playbill. We also talked with Mike Moat, Debbie Moat, Michelle Moat and Rich Fontana. Michelle Moat, excitedly shared with us, that she wanted to sing with her father since she was a little girl. For the second set, Mike Moat returned to the stage wearing a replica of the famous Elvis “Peacock” suit. My favorite song of the second set was “How Great Thou Art,” which was powerful! After the show ended, Mike returned to do four encore songs. The entire program was three and a half-hours! I’ve seen so many incredible Elvis impersonators over the years, but what makes Mike Moat extra special is that he, and his wife, Debbie, truly care about their fans. Throughout the show, the two of them, acknowledged fans in the audience, pointing them out, mentioning their names, where they were from and speaking kind words about them. Mike Moat also jumped into the audience and went around from table to table to shake hands with fans. 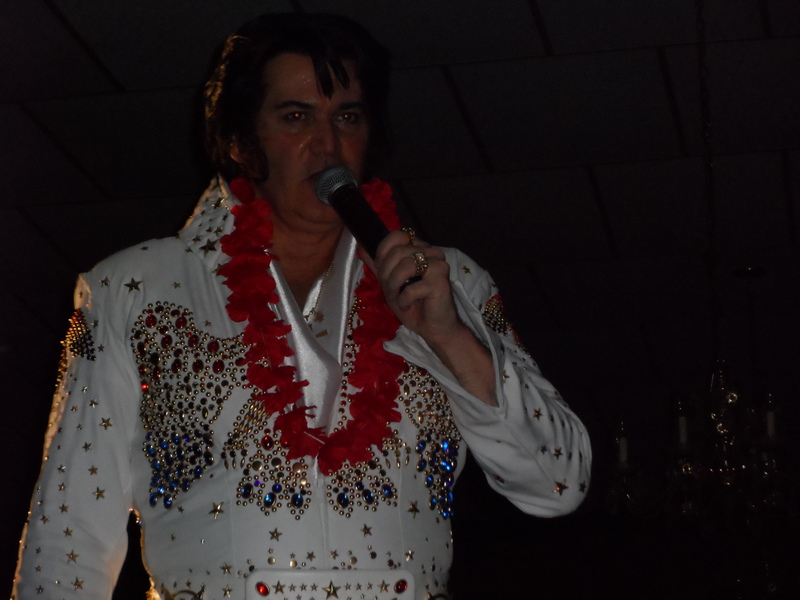 He also gave out more scarves (and Hawaiian leis) than any other Elvis impersonator I saw. After the show ended, I jokingly told Mike Moat I’d see him again when we’re 75. But honestly, I prefer not to wait yet another 25 years to see this fine act again! Last night I was on my very first author’s panel at The West Orange Public Library, along with four other authors. It was exciting promoting “Guest List” as this may be the last promotion. My second book, “Love Cats” (my first fiction effort) will be coming out spring 2015. I have a potential publisher interested and I should know by the end of January. If not, I’ll be self-publishing again. The long wait is over. The book is finally here. Grab your copy now! I used to be afraid of driving in the snow. But for 2015, I have a new outlook. If I get killed in a car accident, that’s an OPPORTUNITY to come back and haunt everyone who was ever mean to me … while they are taking a shower … on the days they forgot to shave. So there!